What Do Chefs and Cooks Do? Chefs and cooks prepare food in restaurants and other dining establishments. They supervise other culinary workers and oversee the running of a kitchen and, often, an entire dining establishment. Larger restaurants may have an executive chef responsible for the management of the kitchen. As the title implies, it’s an executive position and does not involve a lot of hands-on work in a kitchen. Head chefs typically run the kitchen, and in operations without an executive chef, they are the top-ranking person in the kitchen. Sous chefs are next in line and generally serve as a head chef’s top assistant. Most of the hands-on work in the kitchen is overseen by the sous chef. After that, there can be multiple cooks, line cooks, prep cooks, and more, all responsible for different aspects of food preparation. Responsibilities will vary depending on the specific position. Head chefs and sous chefs spend a lot of time involved in managing employees and making sure the operation is running smoothly on a day-to-day basis. The head chef may focus on more creative work, such as creating menus and dishes and helping to plan menus or presentations for special events. Sous chefs will focus on the actual day-to-day food preparation and overseeing the rest of the kitchen staff. In addition to creating many meals efficiently, chefs and cooks also need to be cognizant of food safety regulations and making sure the kitchen remains compliant with how food is prepared and stored. 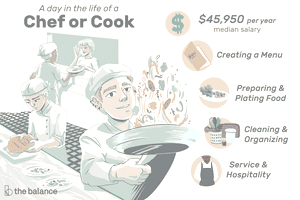 Pay for chefs and cooks can vary depending on the position and the size of the restaurant. Entry-level positions as cooks can be relatively low paying, while head chefs in top restaurants can earn quite a bit of money. No formal education is necessary to become a chef or a cook, but culinary programs at colleges and vocational schools and some certifications can help with advancement. Most top chefs have some kind of formal training. Education: Culinary programs usually include hands-on opportunities for students to improve their skills in the kitchen. They also cover additional aspects of the job, such as managing and ordering inventory, planning menus, knife skills, and food sanitation, among others. Most programs require internships of some sort and help place students in commercial kitchens where they can meet that requirement. Certification: The American Culinary Federation offers credentials for executive chefs, sous chefs, and personal chefs. Depending on the level, it can take anywhere from months to years to meet the requirements for certification. Culinary careers are about more than being creative and efficient in a kitchen. Chefs and cooks need to be able to replicate dishes many times over night after night in what can be a challenging environment. There are several soft skills that can help with this. Physical stamina: Chefs and cooks are on their feet in a hot kitchen for several hours at a time. Despite the sometimes grueling environment, they need to maintain mental sharpness and focus. Manual dexterity: Knife skills are an important part of the job. Whether it’s slicing meat, vegetables, or any other dish, chefs and cooks need to be able to do so quickly, accurately, and consistently. Poise: Anyone who has worked in the food service business knows how hectic it can be and how easily problems can snowball. Chefs and cooks need to maintain their composure during the busiest of rushes no matter what obstacles might be in the way. They also need to help the rest of the kitchen staff navigate problems or busy periods of time. Communication: Everyone in the kitchen needs to be able to communicate effectively with one another and with the wait staff. Chefs who own their own restaurants also may need to communicate with customers who are demanding or otherwise unhappy with their meals. Attention to detail: Slight changes to recipes can have a significant impact on the outcome of a dish. Chefs and cooks need to make sure every dish follows the correct recipe precisely—every night. As well, when creating dishes, chefs need to have a firm grasp of the impact subtle changes can make. Job opportunities for chefs and cooks are expected to grow at a rate of 10% for the decade ending in 2026, according to the U.S. Bureau of Labor Statistics. Much of the growth is attributed to consumer demand for healthier dishes and an increase in the number of people dining out. Work is fast-paced and can be stressful. It also involves standing for long periods of time which can be physically grueling. Injuries such as cuts and burns are common, as are those caused by slips and falls. Most chefs and cooks work in restaurants where they manage or help manage kitchen staff. Some might own or work for a catering business, which means there will be local travel in addition to the prep work done in a kitchen. Restaurants frequently are hiring kitchen staff, and experience is key to advancement. Identifying someone in a higher position who can serve as a mentor also helps with advancement.